Being the furthest from central London, the Royal Docks were the last of London’s docks to be built, the last to be closed, and the last to be regenerated. There have been some new developments in the Royal Docks, but there remain large parts which are available and ripe for development if only there was some momentum and appetite to be bold. 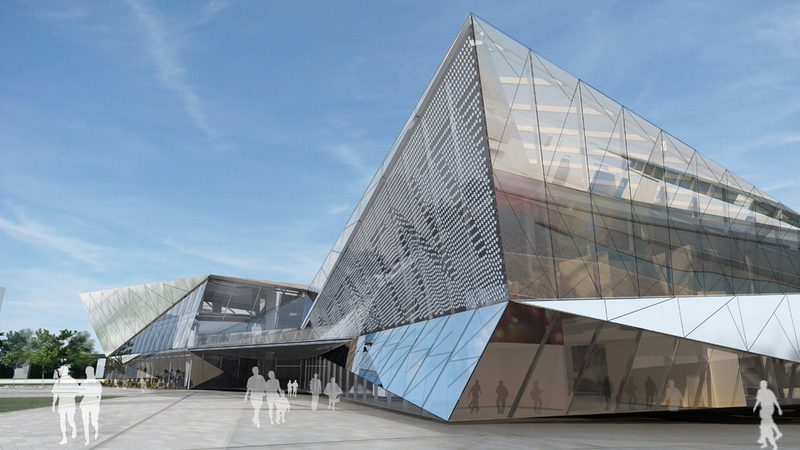 Newham and the various London regeneration bodies have long felt that the area could form a major area for visitors. ExCeL brings in several million visitors a year, but almost all of these are associated with various trade shows and conferences, with heavy spikes for large shows and long periods without any large events, so these shows don’t bring many visitors to explore the docks. Various schemes have been put forward to bring more year-round visitors and get the ball rolling, including advanced plans for a huge aquarium, which fell through, and bringing HMS Ark Royal to the Royal Docks. In 2010 Siemens announced plans for a visitor attraction at the western end of the Royal Victoria Dock (left), focussing on modern technologies, in association with office space. This is well under construction and is planned to bring 100,000 visitors to the area, in a more stable profile than the peaky-event traffic at ExCeL. This still leaves the non-event attractions in the docks looking pretty thin, and yet visible from here is the O2 across the river in Greenwich, a major attraction in its own right and recipient of 5 million visitors a year. This also suffers from peakiness though, being led by arena events despite the presence of a large cinema and lots of bars and restaurants. In the case of both the O2 and ExCeL, moving event crowds is something of a challenge, which is generally well managed but desperately dependent on the Jubilee line and DLR (respectively) working perfectly, which didn’t happen often at weekends in the late 2000s while the Jubilee line was being painfully re-signalled. In 2009 the Mayor – prompted by the late Sir Simon Milton – was determined to do something to put the Royals on the map, not least because through the LDA he had some very considerable landholdings in the area which were ripe for development, if only the private sector was interested. 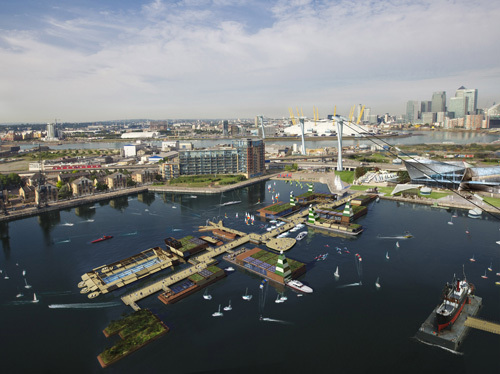 With a large number of synergies between the Royal Docks and the Greenwich Peninsula, a direct link between them could make development in both areas more feasible; for example, the many hotels in the Royals which struggle for customers when there are no events on at ExCeL could better tap into events at the O2, while hotels on the Greenwich peninsula would benefit when the boat show’s on at ExCeL. If people could use the bars and restaurants on either side, they may arrive earlier to eat locally rather than depend on food at the venue. With a higher and more stable customer base the attractiveness of development on both sides would increase, and this would create employment. So, how to link them? A railway line would take several years to build, and would be prohibitively expensive; with an alternative Jubilee/DLR route the cost could never be justified. A footbridge? Still very expensive, at over£100 million, comparing it with a similar proposal at Rotherhithe. And it would still only drop you at the river’s edge, with a 10-15 minute walk through grotty industrial estate to reach the docks, and with no revenue from users, it would be an expensive structure to maintain and keep secure. A tunnel would cost more, yet have the same downsides as a bridge. 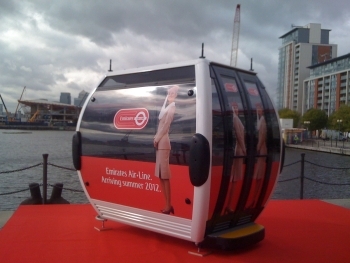 A cable car was previously considered by green groups as an alternative to the Thames Gateway Bridge, at the other end of the docks; doing the same at this end of the docks would be half the cost of a footbridge, and would oversail the industrial estate, getting over the problem of the walking distance from the Thames to the docks. 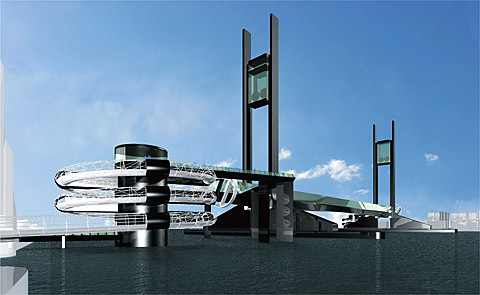 It would provide a second link across the Thames from the Peninsula to help resilience, and link ExCeL to the O2. What’s more, it would be an attraction in its own right, attracting visitors to the area and supporting other local jobs. With half an eye on the upcoming Olympics, when the scheme would link two venues, the Mayor didn’t hang about and took something of a gamble on being able to raise some private cash, giving the scheme the go-ahead in Spring 2011 with an ambitious one year programme, aiming to open in summer 2012. Will this be pre- or post-Olympics? Technically it doesn’t matter, the Olympic organisers are assuming it won’t be ready, and rightly so. But if it were open, I’m sure it would be hugely successful in those weeks. Yesterday the Mayor – presumably with a huge sigh of relief – announced that Emirates would be sponsoring the newly christened Air Line. Out of a total build cost of £45M, they are paying £36M, leaving only £9M with TfL. And there’s a bid for European funding in too, so Boris may just pull the funding rabbit out of the hat. Even if TfL picked up the bill for the difference, that is small change; upgrading Victoria station will cost £700M, and that’s just to ease station crowding. (Not saying that’s a bad thing to do, but you’d lose the cost of the cable car in the budget for that scheme.) And who knows, it may even make a huge profit. If the London Eye pulls in 3.7M visitors each year at an eye-watering £13-31 a ride, who’s to say TfL won’t be pulling in profits to help other services? So, will it help with regeneration? It will undoubtedly add to the attractiveness of the O2 and ExCeL as venues, as there will now be more ways to get there (and away), more hotel beds within striking distance, and something else to do while you’re in the area. That means more jobs all round. It will surely massively increase visitors to ExCeL, and ties in beautifully with the new Skywalk which O2 are going to build next year as part of the strategy to get year-round visitors not coming to gigs. And what about new developments? It can’t be a coincidence that the SS Robin will be mooring in the Royal Victoria Dock next to the new station. And there’s another application for a floating village to be built alongside (see left). 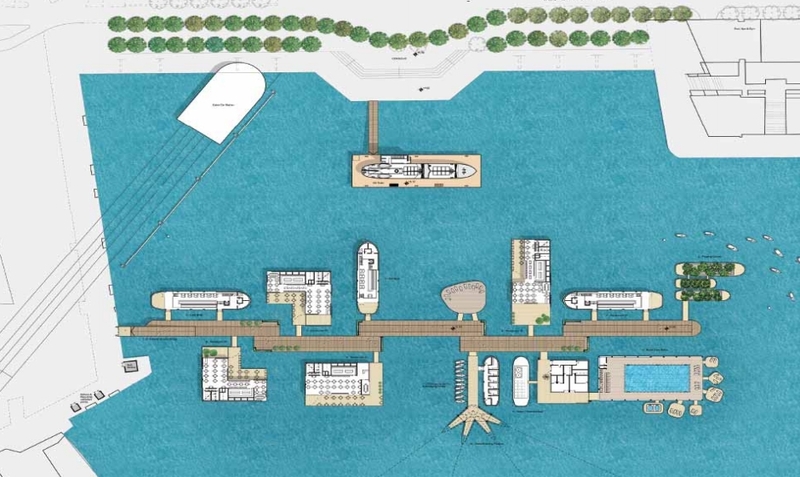 This will comprise a swimming pool, restaurants, bars, cafés, and watersports, bringing new life to this dock, and a number of new jobs. Are the Royal Docks on the verge of the tipping point, with a critical mass of complementary new developments making this a viable destination, and spurring new developments on the remaining brownfield sites? Some think so, and I certainly hope so too. Wary of the aquarium failure no-one should count their chickens, but for me the cable car, sorry Emirates Air Line, could just be the shrewdest thing the current Mayor’s done in his term in office.